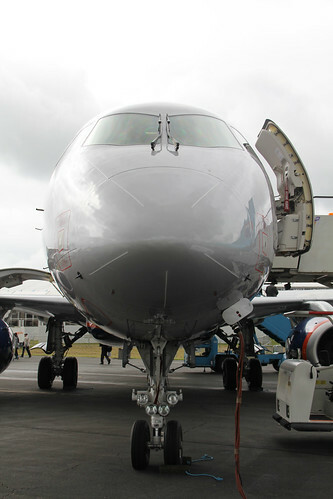 Sukhoi Civil Aircraft Company (SCAC) jointly with leading Russian companies, members of the United Aircraft Corporation (UAC), participated in the 48th International Airshow Farnborough 2012 held in London from 9 to 15 of July 2012. One of the Aeroflot’s Sukhoi Superjet 100 (SSJ100) was displayed for the first time at an international airshow. The aircraft MSN 95016 was viewed and visited in the static display and it was much appreciated by the participants and guests of the airshow. SCAC’s exhibit located on the UAC stand in Hall A, also attracted the attention of a great number of visitors.